Let's be honest the Melbourne Storm have 3 of the best players on the planet, one of the best coaches going around and an ability to get the best out of a player... that's a potent combination. They deserve favouritism to take out back to back titles with the Bunnies' star studded team, the strike power of the Cowboys and the runners up from last year Canterbury their biggest threats. In the next rung the Raiders, Sharks (hopefully with a full squad), Sea Eagles, Knights, Broncos and Roosters look capable of a Top 8 spot, leaving the Tigers, Titans, Dragons and Warriors a season to prove us wrong by make the playoff charge we're not expecting. That sees the Panthers and Eels fighting it out for the Wooden Spoon... and it'll take a miracle if either team is a legitimate threat for a playoff spot come August. Come September, I'm fairly confident in predicting that anyone who beats the Storm in the finals - will win the comp. Of course that might only come in the Grand Final, and pre-Ben Barba's issues - I had the Bulldogs in the Grand Final with Melbourne. So let's swap the Dogs for the Rabbitohs... and stick with the Storm for back to back premierships. The team for 2013 is as follows - with their Round 1 voting allocation. Now for our Picks for each Individual Award. Greg Inglis, Rabbitohs | R/Ups: Cameron Smith, Storm, Josh Reynolds, Bulldogs. 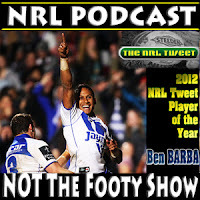 Would have been Ben Barba to repeat as champion, but he could miss as much as half a season, so give us the best big game player in Rugby League ahead of the best overall player and a guy we think might be just as good in 2013 without Barba as he was in 2012 with him. Drury Low, Bulldogs or Josh Drinkwater, Dragons | R/Ups: Tohu Harris, Storm, David Klemmer, Bulldogs, Jack Buchanan, Tigers. If Barba doesn't return soon, then Low could be the real story of the season. The sooner Drinkwater is the Dragons' #7 the sooner he might run away with this. Harris is a raw talent who will get good game time, while Klemmer and Buchanan might struggle for minutes to win this award. Nathan Merritt, Rabbitohs | R/Ups: Akuila Uate, Knights, Josh Morris, Bulldogs, Sandor Earl, Raiders. With Barba out of the running, let's go with the tryscoring machine known as Nathan Merritt. 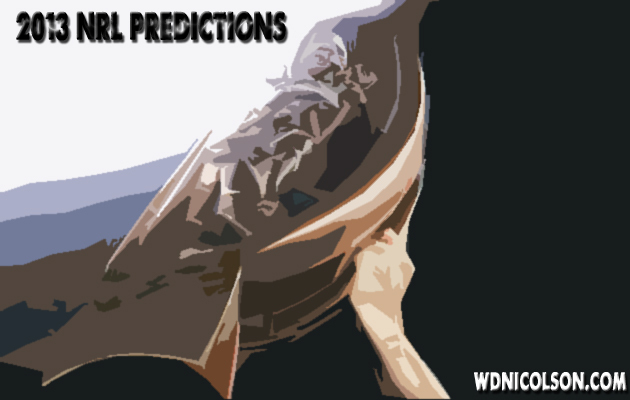 So there are our predictions - hope you enjoy the game tonight and make sure you give our Season Previews a run for a better look at your team's chances in 2013. Share your predictions by commenting below or replying on Twitter.